While it's true that more people now purchase goods and services online in America, retail sales can still be impacted by economic uncertainty and other key factors that could derail spending. Moreover, buying various consumer electronics and associated services is common during the holiday season -- so these retailer trends matter to the Technology, Media and Telecommunications sector. comScore reported holiday season U.S. retail e-commerce spending from desktop computers for the first 52 days of the November-December 2013 holiday season, showing that $42.8 billion has been spent online from desktop devices -- that's an increase of 10 percent compared to the prior year. "The final online shopping week saw considerably softer sales than anticipated -- including zero billion dollar spending days -- although Monday and Tuesday came close," said Gian Fulgoni, chairman at comScore. Strong momentum coming out of Thanksgiving, in addition to heavy weekend buying, suggested that America would meet or exceed expectations as long as momentum continued through the final week before Christmas. However, the final season growth rate will ended up a few percentage points shy of what comScore had anticipated. They believe that this online holiday season was one where absolute dollar sales gains in consumer spending were held back by heavy retailer price discounting, that occurred in an attempt to stimulate consumer demand. 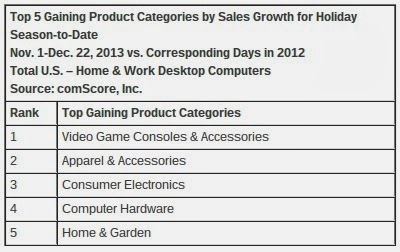 For the 2013 holiday season, Video Game Consoles and Accessories ranked as the top-gaining product category vs. year ago -- followed by Apparel and Accessories, Consumer Electronics (bolstered by smartphone sales), Computer Hardware (bolstered by tablet sales), and Home and Garden. The season was once again led by Cyber Monday (Dec. 2) with a record $1.735 billion in desktop spending, followed by Tuesday, Dec. 3 with $1.410 billion and Green Monday (Dec. 9) with $1.401 billion. The 2013 holiday season saw 10 days with more than $1 billion spending, but down from last year’s total of 12 individual days, reflecting the compressed calendar between Thanksgiving and Christmas that featured six fewer days of online shopping.